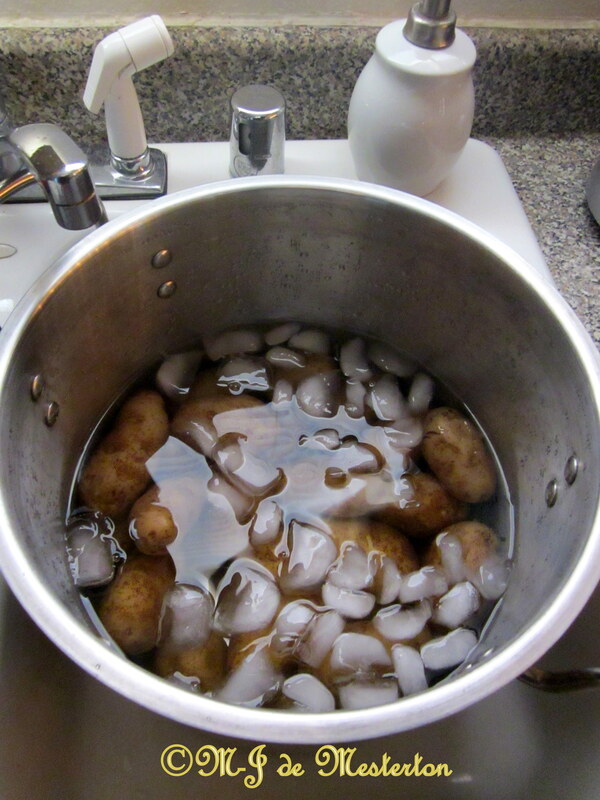 The potatoes, after having been drained of hot water, sat in the stock-pot to cool for a few minutes. 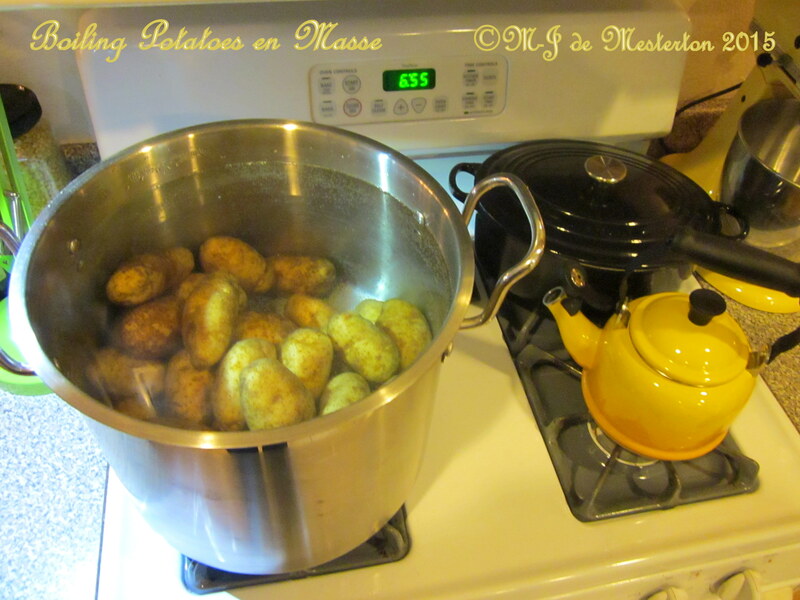 To peel them, I simply throw some ice and cold water over the potatoes, let sit for ten minutes, then the jackets will usually slide off easily, leaving a very attractive spud indeed, ready to be frozen for later use. Depending on what you iintend to use the potatoes for, they may be frozen in their skins, which is a breeze. 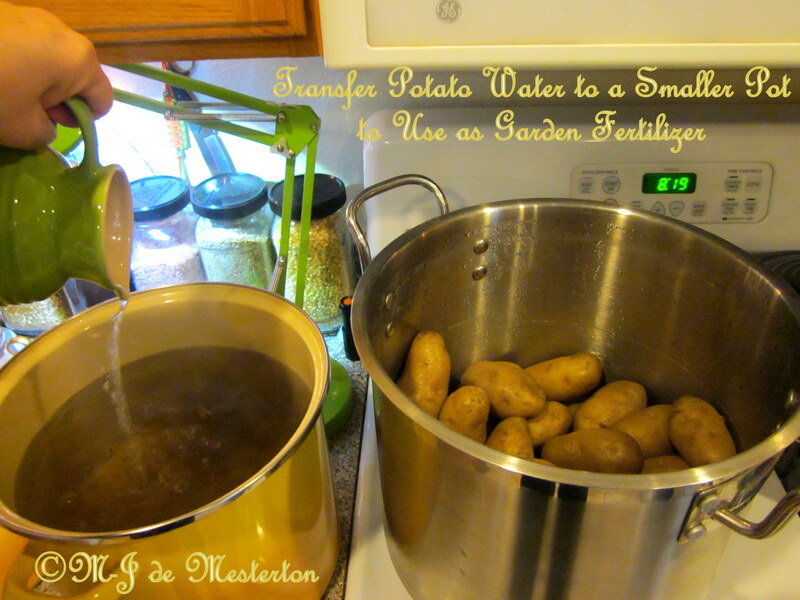 I developed this method of preparing potatoes for the future when an economy-sized bag of them threatened to sprout. 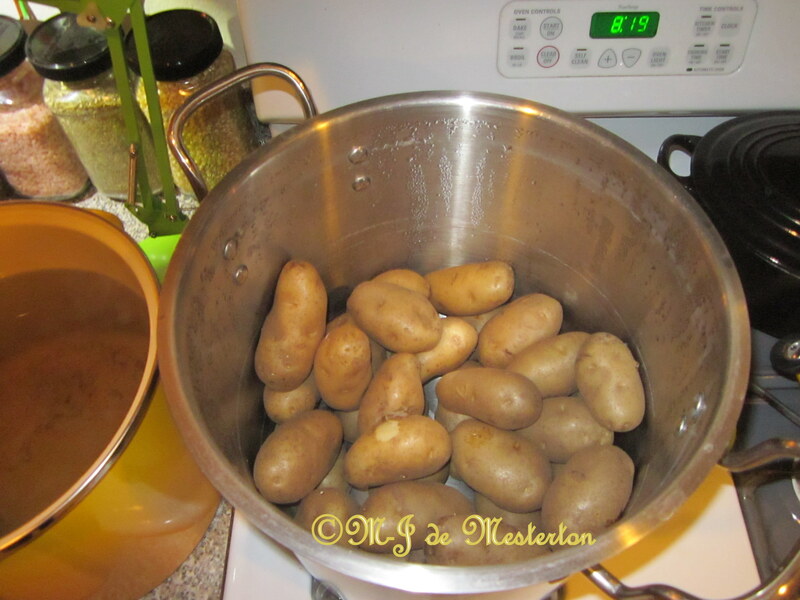 To prevent the spuds from going bad, I boiled and peeled and froze them. They are perfect when turned into gratin Dauphinois, hash-browned and mashed potatoes. 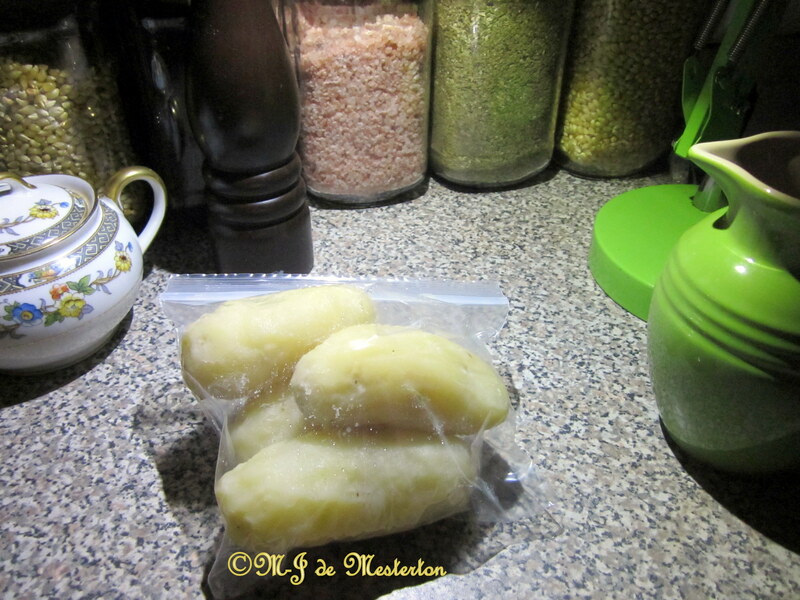 These boiled potatoes are ready to be doused with ice-water for easy peeling. When the spud-jackets are removed this way, there is no waste like there is when a peeler is used on raw potatoes. These particular potatoes have such delicate skins that, testing them for softness, I smashed one in a bowl, seasoned it with Himalayan salt and Malabar pepper: the little spud, jacket included, was delicious! 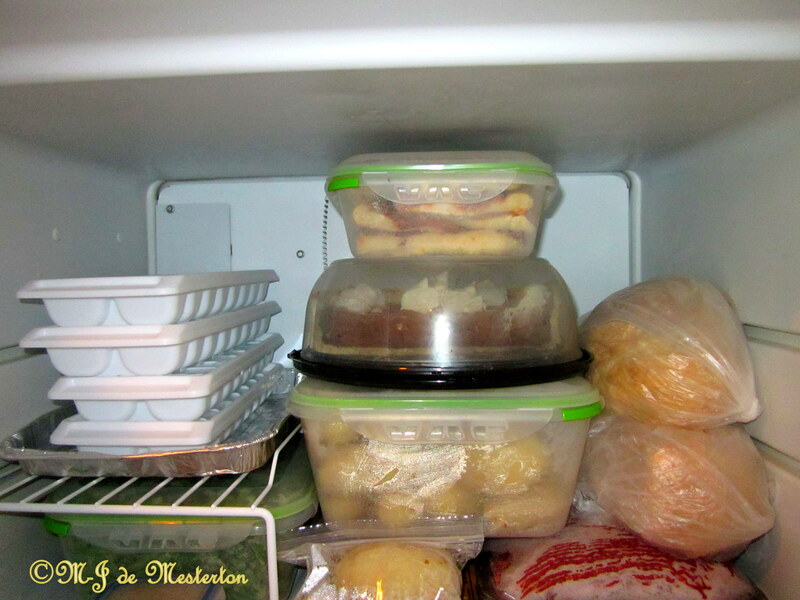 Potatoes, when cooled, may be packed in zippered bags or BPA-free food-storage boxes for freezing. In the freezer, there are a few spuds in a bag and the majority of today's produce in a BPA-free Ozeri Green Earth container, flanked by haricots verts and home-made bread, topped by stacked home-made pizza slices and yesterday's chocolate pie. See Elegant Breakfast for M-J's original Eggs Vienna recipe.